The Egyptian pyramids are ancient pyramid-shaped masonry structures located in Egypt. There are 138 pyramids discovered in Egypt as of 2008. Most were built as tombs for the country's Pharaohs and their consorts during the Old and Middle Kingdom periods. 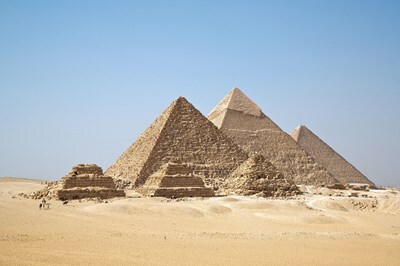 The earliest known Egyptian pyramids are found at Saqqara, northwest of Memphis. The earliest among these is the Pyramid of Djoser (constructed 2630 BCE–2611 BCE) which was built during the third dynasty. This description uses material from the Wikipedia article on Egyptian pyramids and is licensed under the Creative Commons Attribution-ShareAlike License (view authors). 80 people want to do this.